When the Calgary Flames are brought up in a conversation, people automatically see the faces of Jarome Iginla, Mikka Kiprusoff, and Rene Bourque. These players have been the center pieces for this franchise since as early as 1995. Making them a bit older than the rest of the league. Along with those previously mentioned, the rest of the Flames roster are on the older side as well. Olli Jokinen, 32, and Brendan Morrison, 36, are two of the ten players in the Flames line-up that are 30 years old or older. Which contributes to the Flames having an average of 30 years old, making them the third oldest team in the league behind only the Pittsburgh Penguins and Detroit Red Wings. Although the Flames have a cast that have been around the league for quite some time, they have continued to be in the playoff race in recent history. They finished in 10th place the previous two seasons, after late season pushes fell short, and finished in 5th place in the West three seasons ago. But, one thing lingers on the minds of Flames faithful, how much longer can the Flames be among the NHL's best with a roster chalk full of seasoned vets. 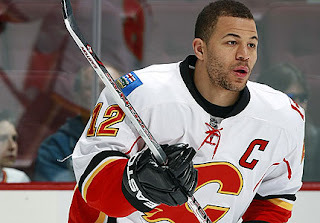 Iginla is signed through the '12-'13 season, when he will be 36 years old, Kiprusoff will be with the Flames through at least the '13-'14 season, when he will be 37, and Bourque will be with the Flames through the '14-'15 season when he will be 33 years old. If these pieces are still with the Flames at that point of their careers they will have aged even more and gotten further away from their prime. Sure the Flames by no means have had as bad a season totals as other teams in the league, but there lack of success may be cause for a drastic overhaul in the near future. Unless the Flames make a serious push and assert themselves as contenders for the Cup within the next season or two, they may have to ditch some of their old timers and make moves towards bringing in the youth movement. Although I'm certainly not a fan of the moves that jay Feastor has made so far (Shedding veteran character guys who are still effective in their roles for young plugs with little upside and inconsistent fringe players), I agree with him that a complete blow-out is unnecessary for a rebuild. The key is to invest in scouting and player development in order to spot and assimilate young talent into the Flames aging core. They have already done a solid job of that. Sven Bartschi and Marcus Granlund were very good picks, and the hope is that they can develop into top-6 forwards. There is also still hope for Mikael Backlund, Ryan Howse, Mitch Wahl, Greg Nemisz and John Ramage. Flash forwards to 2013 when Iginla becomes a 36 year old UFA. Although his body will be worn down by that time, he should have a couple of years left as a 20-25 goal scorer. Rene Bourque will be 31 and still effective, while Curtis Glencross will still be in his prime. Now surround them with the young men listed above, and you should be able to pull off a decent top-6. But that's not counting players drafted in 2012 and beyond...these picks will be key. Kiprusoff will be the same age, and as Tim Thomas and Dwayne Roloson have shown, age does not have to be a factor for goalies. Especially if the Flames are serious about reducing his workload (I truly beleve that Kiprusoff's inconsistencies have been because of over-use. Start him in 60 games rather than 70-75, and you have your Vezina candidate back). There's no reason that the Calgary Flames can't make the play-offs for the next few years and build for the future at the same time. All it will take is schrewd drafting and attenting to devloping these players into NHL regulars. Lack of this in the past has brought the team to where it is today. But there is no need to blow up a core of guys who live and breath Calgary.